CORAL GABLES, Fla., July 26, 2016 /PRNewswire/ -- For the second year in a row, Bacardi, Million Trees Miami and American Forests joined forces to plant trees in Miami-Dade County at as part of American Forests' Community ReLeaf program to help beautify and restore urban neighborhoods. As part of its annual Corporate Responsibility Month initiative to engage employees in community activities, the Bacardi team of volunteers came out with their sleeves rolled up, ready to plant 20 mahogany and oak trees at Amelia Earhart Park in Hialeah, Florida. As part of its annual Corporate Responsibility (CR) Month initiative to engage employees in community activities, a Bacardi team of volunteers joined forces with American Forests and Million Trees Miami to plant trees at Amelia Earhart Park in South Florida. Since beginning this environmental sustainability initiative with American Forests, Bacardi has planted more than 75,000 trees throughout the United States. "Giving back to the community is a part of Bacardi's DNA. This is something we've always done going back to our founding in Cuba in 1862 and we continue this legacy with what we do out in the communities where we live and work," says Ed Knutel, commercial planning and activation manager, for Bacardi in the United States. Since beginning this environmental sustainability initiative with American Forests, Bacardi has planted more than 75,000 trees throughout the United States, and will continue to have an impact as part of its "Good Spirited" environmental sustainability efforts. "What we are doing here with Bacardi is not just about pretty aesthetics, it's about community well-being, environmental justice and human and ecological health," said Ian Leahy, director of Urban Forest Programs, with American Forests. "There is a lot of science that shows the positive health impacts from planting trees in local communities." "What Bacardi employees are doing in South Florida is an example of how a few people can make a huge difference in a community," adds Patrice Gillespie Smith, manager, Million Trees Miami. "Miami-Dade's trees remove nearly 5,500 tons of carbon from the air each year, improving air quality. Trees can also add up to 15% to the value of your home by making neighborhoods more attractive, quieter and cooler." 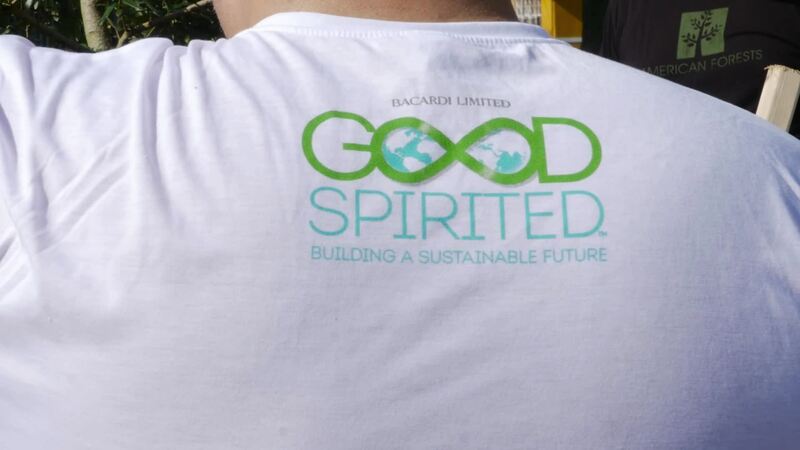 To learn more about Bacardi Limited and its "Good Spirited: Building a Sustainable Future" environmental initiative for sourcing, packaging and operational efficiencies across the entire Bacardi family of premium spirits and wine brands, visit http://www.bacardilimited.com/good-spirited. BACARDI, THE BAT DEVICE AND OTHER MARKS OF THE BACARDI GROUP PRODUCTS ARE TRADEMARKS OF BACARDI & COMPANY LIMITED OR OF OTHER SUBSIDIARIES OF BACARDI LIMITED.